You have added Twist of Fate Chiffon Maxi Dress in Lavender Grey into shopping cart. Maybe it was fate or just good luck that caused you to stumble across this gorgeous chiffon designer dress. This pretty dress has a simple classic cut amped up with unexpected detailing at the bust to give it an extra special touch. 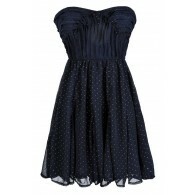 We think this would make a beautiful bridesmaid dress or a great formal dress. The Twist of Fate Chiffon Maxi Dress is fully lined and made of chiffon. It has a strapless sweetheart neckline and lightly padded bust. The best part of this dress has to be the lovely fabric twist design at the bust. The empire waist gives way to the flowy maxi skirt. A hidden back zipper completes this dress. The Twist of Fate Chiffon Maxi Dress is perfect paired with strappy heels. Details: Fully lined. Lightly padded bust. Hidden back zipper. 100% polyester. Lining: 95% polyester, 5% spandex. Dry clean only. Small measurements: Length from top of bust to hemline: 57". Bust: 32". You have added Twist of Fate Chiffon Maxi Dress in Lavender Grey into Wishlist. You have added Twist of Fate Chiffon Maxi Dress in Lavender Grey for Stock Notification. 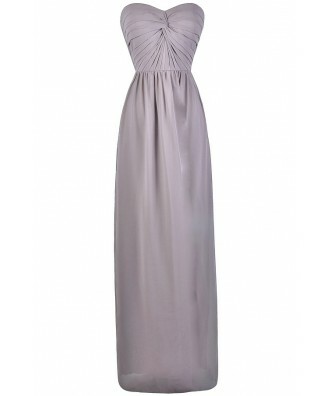 You have set Twist of Fate Chiffon Maxi Dress in Lavender Grey as a loved product. 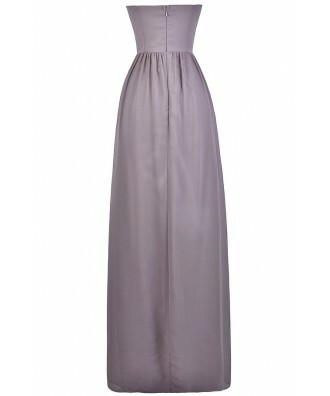 You have removed Twist of Fate Chiffon Maxi Dress in Lavender Grey as a loved product.